I had so much fun making that Modcloth wishlist last week, so I made another one! 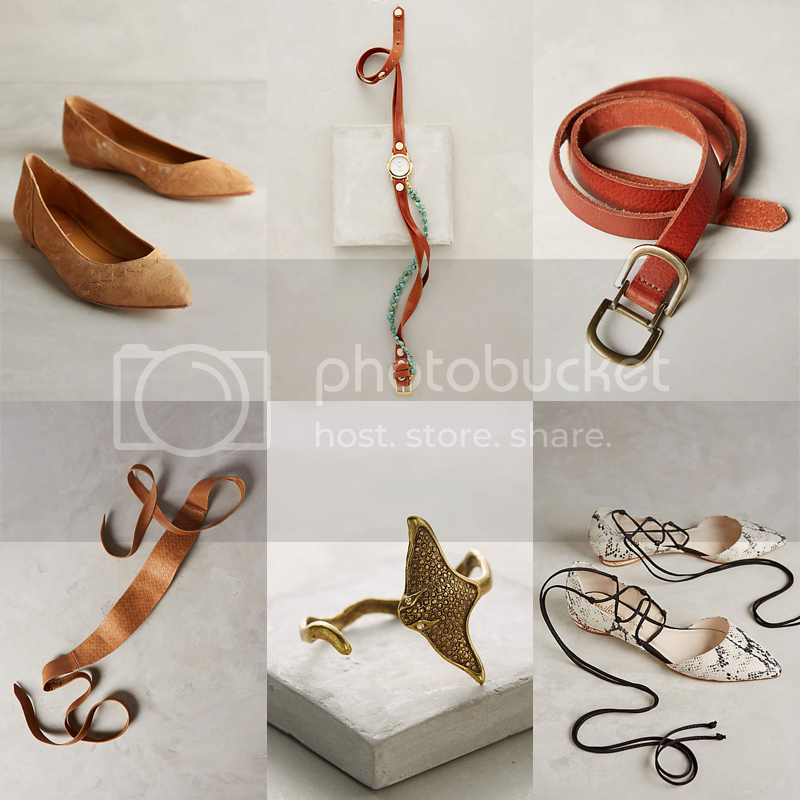 Featuring Anthropologie this time, of course. Their latest catalog showed up in my mailbox over the weekend and a few things caught my eye, so obviously I had to check out all the new things available online! Surprisingly, what caught my eye wasn't the clothing this time around, but the accessories. In my quest to minmaximize my wardrobe, one of the things I'm looking for is a lovely pair of neutral flats. My current favorite ones are on their last leg, and the other two pairs I own just don't suit my style anymore. Two pairs caught my eye, along with with some other accessories. One quick look at this list tells you I'm really into the wrap-style that has been coming back around lately. Shoes, belts, bracelets... it's all fair game. I love watches, but I'm just not a watch wearer. I can't get into it. Then I saw the wrap style watch and an alarm went off in my head... DING DING DING! It's the best of both worlds! I'm incredibly simplistic when it comes to jewelry. I'm a one, maybe two-piece wearer; usually a long necklace, or a leather wrap bracelet and that's it. I've been trying to throw more belts into my outfits too. If there's one thing that reading fashion blogs has taught me, it's that if you're wearing a dress, it never hurts to belt it! I still don't feel completely comfortable rocking the waist belts, but there's definitely something to be said for that hourglass figure they create. But back to shoes.... can I ask you all a question? (FASHION TALK!) Is it okay to wear brown shoes with an all/mostly black outfit? Does that work? I'm always hesitant to because I feel as though the colors don't "go" together. Neutral colored shoes are my biggest struggle because I've always been all about wacky, patterned, or brightly colored shoes. (Hence the snakeskin pair...) But when it comes to neutrals, I just can't seem to figure out the right color to get. The Trask flats are actually available in grey too. Maybe that's the way to go? Come on! Let's talk neutrals!